While the hospital’s communication processes seemed to be standard, internal discussions revealed that text messaging had emerged as a newer, faster, easier way for residents and attendings to connect with each other. However, the IT staff at St. Vincent quickly realized that this “path of best efficiency” was not secure. Because securing protected health information was a priority, the organization immediately began searching for a solution that allowed easy and secure communication between residents, attendings, nurses and other clinicians— and would ultimately benefit their patients by enabling fast and efficient clinical decision making. Dr. King and his team at St. Vincent learned about PerfectServe from their colleagues at sister hospital, St. Rita’s Medical Center, which had just completed implementation of the solution. After internal discussions with the CEO and regional leadership, the team decided PerfectServe was also the right solution for St. Vincent. St. Vincent began with a pilot program. As the implementation progressed, it became apparent just “how much the PerfectServe solution illuminated some legacy processes that were profoundly dysfunctional,” said Dr. King. Because paper call schedules were not being updated each time a physician’s schedule changed, nurses were often making multiple phone calls in an attempt to reach the right person. Since the manual process was convoluted, automating it with technology immediately brought the legacy issues to light and physicians clearly saw the impact of not keeping schedules up to date. PerfectServe’s Dynamic Intelligent Routing™ capability automatically identifies and provides immediate connection to the right care team member for any given clinical situation at every moment in time. If physicians didn’t update their schedules in the PerfectServe mobile app, they still ended up getting calls that they were unable to answer and should have been routed to the designated covering resident or attending. St. Vincent introduced a process improvement step to address this challenge, and the hospital began holding physicians accountable for updating their own call schedules. To effectively manage this new process, physicians are now mandated to keep their schedules updated directly in the PerfectServe mobile app. Additionally, St. Vincent also now requires 700 of the employed physicians and residents to use PerfectServe as the only mode of secure communication with each other. All other physicians who are affiliated with St. Vincent are also strongly encouraged to use the solution. St. Vincent’s IT staff partnered with the PerfectServe professional services team for a smooth implementation and go-live. The St. Vincent team allocated staff members and other technical infrastructure to support physicians during the PerfectServe implementation, which helped the transition. While analog phone and pager users required a bit more hand-holding, the majority of technology-savvy physicians were fully functional within a month. In addition to standard text messages, the staff at St. Vincent realized another significant advantage with PerfectServe — the ability to send attachments securely. They can now share X-rays, photos or images, and more easily consult with other physicians on patient care. With the implementation of a secure care team collaboration solution and internal process changes, Dr. King and others at St. Vincent have ensured that patient-centered communications happen securely and quickly. “It is encouraging to know we have a tool [physicians] can use that makes communication easier and faster for physicians, patients and their families. I can get more done in a given day using PerfectServe than I ever could before,” reports Dr. King. 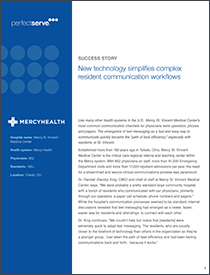 The team at Mercy St. Vincent Medical Center plans to broaden the use of PerfectServe throughout the health system. According to Dr. King, they are focused on getting every physician using the solution as well as keeping them trained and compliant with new processes and security protocols. The hospital is also looking forward to enhanced functionality for its nursing staff. Nurses have recognized the rapid transition to secure texting and want the ability to text directly and securely with physicians. Dr. King is anxious for other northern market facilities, Mercy St. Charles Hospital and Mercy St. Anne Hospital, to implement PerfectServe so they can truly have seamless care team collaboration among clinicians throughout the system. Mercy St. Vincent Medical Center is the critical care regional referral and teaching center within the Mercy system, a seven-hospital, faith-based system serving Northwest Ohio and Southeast Michigan. Mercy St. Vincent Medical Center was Toledo’s first hospital, opening its doors in 1855. Eight generations later, it is still charting the course for a healthy community. St. Vincent pioneered many of Toledo’s medical “firsts,” from the city’s first school of nursing in 1869, to the first X-ray equipment in 1915, to the area’s first Life Flight service in 1979. St. Vincent is now home to five Life Flight air ambulances, holds the highest designation for treating high-risk mothers and babies, and is a Level I Trauma Center for children and adults. St. Vincent is also the region’s only Burn Care and Reconstructive Center. St. Vincent maintains a completely modern, attractive and secure campus, and takes a leadership role in providing quality medical education and community development. PerfectServe is healthcare’s most comprehensive and secure care team collaboration platform. The platform is unique in its ability to improve communication process accuracy and reliability via its proprietary Dynamic Intelligent Routing™ capability, which automatically identifies and provides immediate connection to the right care team member for any given clinical situation at every moment in time. More than 400,000 clinicians in forward-looking organizations across the U.S. rely on PerfectServe to help them speed time to treatment, expedite care transitions, enhance the patient experience and reduce HIPAA compliance risk. Headquartered in Knoxville, Tennessee, with offices in Alpharetta, Georgia, and Chicago, PerfectServe has helped clinicians provide better care since 2000. Follow us on Twitter, LinkedIn and Facebook, and subscribe to our blog.